Turning Point USA threw a party at the Conservative Political Action Conference (CPAC) last night advertised by emails featuring a “dabbing” astronaut and ending with the words “Dilly dilly.” It attracted a strange mix of pro-Trump personalities and a couple members of the Proud Boys, which the Southern Poverty Law Center classifies as a hate group. The Daily Beast’s Will Sommer and Maxwell Tani report how Turning Point USA has emerged as a leading voice at this year’s CPAC despite the fact that it is “most famous for filming its members wearing diapers on a college campus.” Last night, TPUSA’s newly minted chief creative officer Benny Johnson—who previously worked at The Daily Caller—invited a swarm of college-age conservatives and their enthusiastic adult allies to gather in hopes of rubbing shoulders with the night’s VIPs: the president’s adult son Donald Trump Jr. and his girlfriend, Fox News host Kimberly Guilfoyle, Rep. Dan Crenshaw, Sen. Ted Cruz, and Fox News executive turned White House Deputy Chief of Staff for Communications Bill Shine. 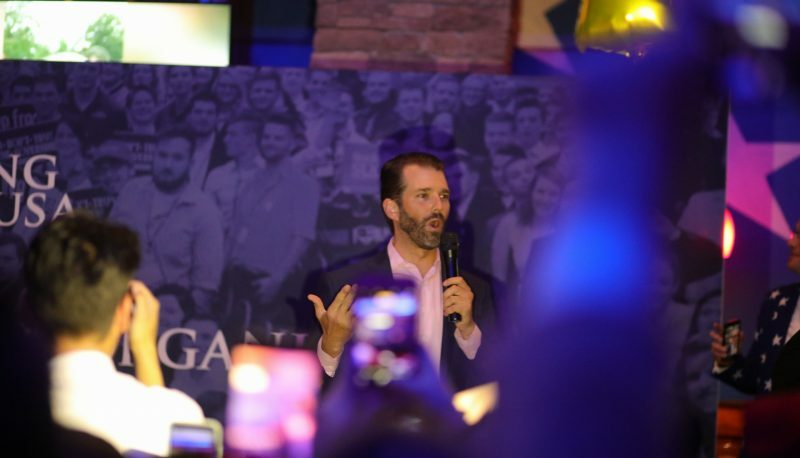 Trump Jr. and Guilfoyle gave brief remarks to attendees of the party, which mostly centered on praising TPUSA President Charlie Kirk and Communications Director Candace Owens and, of course, his father. The duo led the crowd in chants of “U.S.A. !” and “Build the wall!” and “Trump! Trump! Trump!” At one point, Trump Jr. revised a statement in his speech to include the word “balls,” which gathered a roar of applause. This reporter was gazing at the custom drink list at the bar trying to decide whether he wanted to order a pour of “The Wall,” which most would just call whiskey neat, or the “KAVANAUGH ‘I like beer’” which is just a beer, when conspiracy theorist Jacob Wohl approached the bar. He ordered the “Kavanaugh.” Wohl had spent his afternoon hosting a vehemently Islamaphobic press conference, alongside deplatformed conspiracy theorist Laura Loomer, right-wing fraudster Jack Burkman and a “security guard” wearing a single Airpod, alleging that Rep. Ilhan Omar had secretly married her brother. While at the bar, Wohl was enthusiastically greeted by Darla Shine, who is Bill Shine’s wife. Darla Shine has faced scrutiny for tweeting racist things, making sexist remarks, and believing a host of health-related conspiracy theories about sunblock and vaccines. When Darla Shine was introduced to this reporter, she told me she was “nobody.” Wohl later told Right Wing Watch, unprompted, that Darla Shine helps him out. When asked what he meant, he did not elaborate. Enrique Tarrio, current leader of the Proud Boys, and Luke Rohlfing, a Big League Politics writer and “third degree” Proud Boys member, were also roaming the party. They rubbed shoulders with other young activists and at one point Tarrio took a spin on the bar’s mechanical bull. Inside the party there were more than a dozen of cardboard cutouts depicting various celebrities including Arnold Schwarzenegger—and of course, rapper and Trump ally Kanye West. A cardboard cutout of Alexandria Ocasio-Cortez stood on its own for attendees to post with. By the end of the night, the Ocasio-Cortez cutout had been defaced with permanent marker.